Over the years I’ve played hundreds of shows as a keyboardist using my trusty Apex column with various hardware synths. 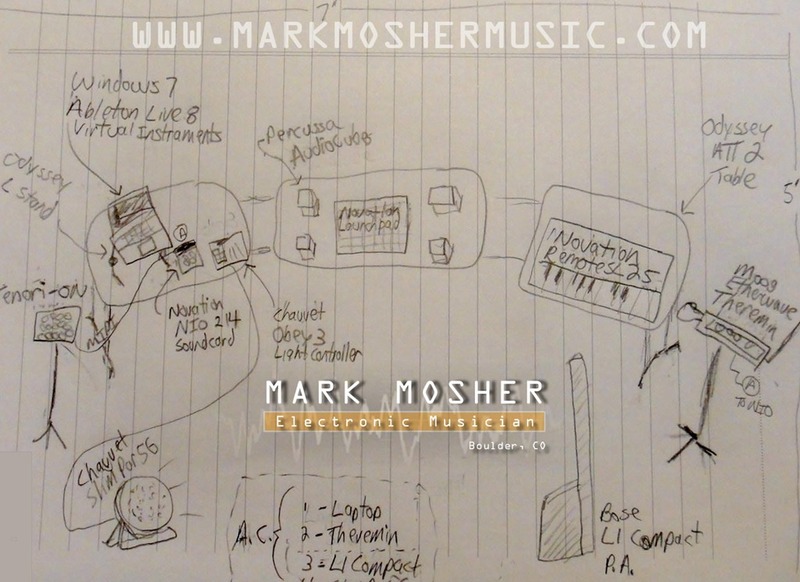 In late 2009 I had a vision to create a new Ableton Live laptop-centric rig using only virtual synths running in Live. While I wanted to play some keys, I was really excited to add alternative visual, tangible, and spatial controllers and selected Percussa AudioCubes, Tenori-On, a Novation Launchpad. I went with my trusty Remote SL 25 for keys as it also doubles as a controller for Live. In the 11th hour I added a Moog Ehterwave Theremin which was clearly necessary to play “They Walk Among Us” live :^). I’ve played enough shows to know that you can’t always count on basic lighting and P.A. to be adequate, so I added these elements to my requirements as well – just in case. My goal was to be able to run a room of 80 people if needed with just my rig. My other goal was 4 trips from the car load-in max with a 15 minute setup time or less. The sketch above shows all this on paper (click the image to see a larger view). After months of slowly building up gear, the reality – sans lighting – is shown in the fun little time-laps video embedded video below. You should definitely do a vid!!! I’m hoping to get down to 10 min with a little practice. Not really. I compose and mix in stereo so if you have a great system or use headphones it sounds interesting. The nice thing about plugging into the Bose is it takes the stereo in and sums into mono and things sound fine to me. That is such a great video. I need to do similar with my rig (10 min set up FTW). Wow, thank you so much for that detailed reponse! 🙂 I don’t mean to pester you with so many questions, but has live/PA sound limitations influenced your compositional process? For instance, if you create space in a track through extensive panning, it’ll sound completely different (aka busy) in a live situation. Same with stereo samples (think omnisphere). Having said that, I have since then tried to make my music as mono-compatible as possible – samples and fx, the exception being reverb. … I might be going too overboard with this. Yes indeed – Bose L1 Compact. By the way, I updated the post to put a list of all the gear in the rig. For years I gigged with a back-breaking Roland KC-550. It sounded great but this time around I wanted light, fast setup with no cables. I’ve gigged a lot and feel in most venues a stereo mix is lost on listeners – either because of the room, or where they are standing. I find Bose’s radial array concept much more compelling. I really like the concept for cases where there might be more than one performer. You know, you’ll hear sound coming from the direction of the performer and not from some speaker way over on the side. As a matter of fact, I just saw Pat Metheny’s Orchestrion, and he had like 8 Bose systems on stage so he could discretely monitor the different elements, and the audiance could hear this as well. So with the Bose, I just plug the stereo out into the the inputs thereby turning everything mono. I personally think the L1 compact sounds great although I had to EQ and re-mix my songs slightly to accommodate it’s character. Now I have eq on the master channel of my live tracks so I can quickly adjust if I jump to a house solution for a gig. The Bose solution disperses evenly at 180 degrees plus at different heights so listeners sitting and stand can hear well. Another cool thing is if you put it slightly in front of your rig so your a little behind the 180 degree dispersion, the volume drops and you can use it as a monitor and a P.A. I recently tested it at the Walnut Room in Denver and it was plenty loud even at half-way up. I suggested you put some of your tracks on an iPod and head down to a Bose store or a local Guitar Center and give it a try. Sweetwater also carries them and has some nice demo videos. Most stores have a money back guarantee as well so you can give it a go. Bottom line, it’s expensive, but the quick setup, light-weight, radial array concept is awesome for my needs. Is that a Bose L1 Compact in your setup? I’ve been seeking a quality audio solution for performing laptop gigs, specifically because I still play mostly house shows. I’ve been thinking about getting two Roland MC-505 keyboard amps (on stands) for a stereo set-up – unfortunately, that’ll cost a lot. Any ideas? Also, how do you approach performing through a mono PA system when your samples and plugins are stereo? These problems have been on my mind for some time now, and I was hoping you’d have some insight. I see, you are using a usb soundcard… that explains it. Maybe I should switch to usb as well, firewire proved to be quite problematic. On a different matter… I’ve read about you enthusiasm for the blofeld before, and as an owner of the keyboard version I can only second that! It’s really a great machine! In my travels I bump into artists using Windows with Ableton Live all the time – although Macs have certainly become extremely popular. I’m using a Windows 7 32-bit, 3GB, HP DV6t-1200 Pavilion w/Core2 Duo P8700 @ 2.53 GHZ, 7400 RPM drive. In my setup I’m using 5 USB controllers & a USB sound card which is all plugged into the HP Quickdoc Docking Station. Anyone other readers know of systems with TI Firewire chip. I see you’re not using a mac… which is quite uncommon in this musical field. Could I ask you what brand/model of laptop you’re using, I’m currently looking for a pc laptop but it’s quite difficult to find one with a TI firewire chip, and all the others just don’t work.